Kilroy’s stance on day four of Worlds was focused and strong. He blasted off the line in race one and two (races seven and eight in the series of ten) extending on the first beat. In race one, Kilroy maintained a lead of more than a minute and a half at the finish line. In the second race of the day, he trailed game winner Pieter Taselaar on Bliksem by a few moments. An eighth place finish in race nine secured an overnight lead of the World Championship. Race three proved to be challenging for every player, with the exception of Vincenzo Onorato’s Mascalzone Latino with Nathan Wilmot as tactician as he too was able to get out front in the shifty breeze and rain maintaining position for the win. Benjamin Schwartz’s Pisces came on strong to take second. Roberto Tomassini Grinover on Robertissima was third. Saturday marks the final day of competition. One race remains with a start at 11.00. The 2012 Melges 32 World Championship Press Team will be bringing live reports and updates of the racing via the Melges 32 Blog. Every start, play and finish will be published, and as connection allows, video from the race course may be provided too. 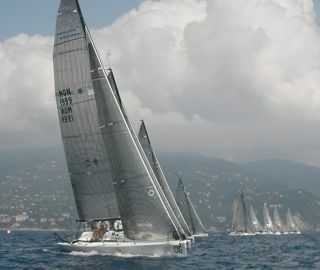 In addition, the latest racing developments will post to the Official Melges 32 Facebook Page. A host of photos from the event can be found online at melges32.com.